Enjoy our activities in Florence and in Tuscany after Parola’s Italian language courses in order to have a complete cultural experience in Italy. Our school constantly organizes extracurricular activities after its language courses in Florence. These social and cultural events are available to Parola students and they are free of charge. Parola school events include visiting art museums and churches, orientation walks in Florence, field trips to Tuscan cities, aperitives, Florentine restaurants and eating pizza, riding bikes in the park, and more. Our Italian school offers a variety of optional indoor and outdoor activities in Florence. Take into consideration that out-of-school activities with Parola Italian language school of Florence are for free, apart from occasional transportation fees when they are required. Please, contact us for more information regarding social activities with our students in Florence. Once a week, one or more of the professors accompanies students to a local bar to enjoy an aperitivo (aperitif), a typical Italian pastime. In this relaxed setting, students and their professors mingle over drinks and small plates of food while conversing in Italian. 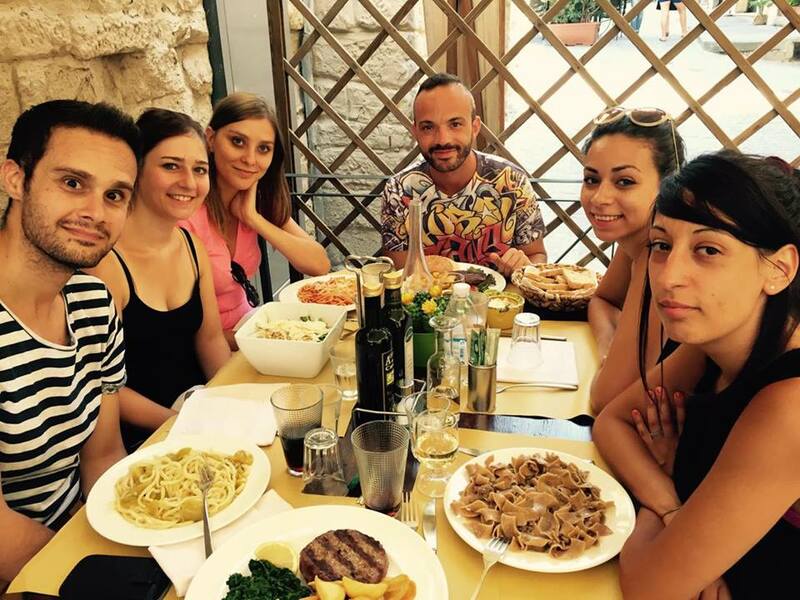 In order to promote a friendly atmosphere amongst the students and teachers at Parola, we organize dinners in local restaurants, socials and evening meetings in the center of Florence. Every so often, a Parola instructor takes students for a bike ride or a leisurely walk through the two main parks in Florence: along the Arno river at the Cascine Park, the largest and most renowned park in Florence. Parola Italian language school organizes sightseeing trips to the most interesting cities in Tuscany, including Siena, San Gimignano, Pisa, Lucca, and the seaside. A member of Parola school accompanies the students on all of these excursions, which are for free to students except for the bus or the train ticket. For these fun and instructional tours, a guide from Florence For Fun accompanies students the beautiful wineries in the Chianti region. The estate owners explain their wine production methods and, of course, let students taste their wines. Parola also organizes trips to an olive oil production factory in Tuscany, more specifically in the city of Lucca. There, our students can see the process of making Tuscan olive oil. Any interested students can be accompanied by a Parola instructor as a group excursion to the most important museums in Florence, from the Uffizi Galleries to the beautiful Bargello and the Duomo museums. The school can also make reservations for private museum visits for students who want to see the exhibits during their stay in Florence. Florence is famous for master craftsmanship in art forms of all kinds. Tours to the workshops of these craftsmen are organized according to craft (art restoration, jewelry making, pottery, and so on) and are conducted by one of Parola’s teachers. One such tour that we offer is a visit the fascinating and historic leather workshop of Santa Croce. In Summertime, special excursions are organized to see opera performances at the Arena in Verona, La Scala in Milan or the Puccini Festival in Torre del Lago. Note: these excursions are not free. A Parola instructor takes students to the movie theater to see an Italian film. Once a month, Parola organizes Sunday trips for Au Pairs and other students who work or cannot take part in excursions Monday through Saturday. Even in Florence, students can engage in their favorite sports: Parola school can provide information regarding Florentine sports and athletic organizations. We are happy to share detailed information regarding the places where students can go jogging, play golf or tennis. Parola students can enjoy discounts at many local restaurants. Furthermore, once a week students can go for an evening aperitivo with one of our teachers. Parola students are always informed about the activities offered by the school. At the beginning of each week language program, students are given a schedule of all of our extracurricular activities. Students are also informed of events verbally in their regular daily classes. Parola Italian language school participates in the main cultural events in Florence as well, so students can enjoy concerts, festivities, and exhibits. For more information regarding free time events through Parola school, please contact us in Florence.